I had taken back roads all the way out to Hawkesbury and was returning home via highway 17. There was a convenient gas station and Tim’s in Alfred. A top up would get me home without stopping and it was time for some water and a snack. Gas station was first so I pulled up to a pump. This is where less than a second of inattention comes in. I didn’t ensure my kick stand was fully engaged before I started to lean the bike over. And down it went. Once a bike starts to go, it’s real hard to stop it. One moment I’m looking at the price of Premium and the next moment I’m staring at my toppled over moto underneath me. I admit I was confused for a bit. Well, an opportunity to work on my deadlift. Initially it seemed like a total non-event. Some minor scuffs on the plastic. Sad, but it is a GS after all. Everything looked to be in order so I proceeded to fill up. Yes, I should have confirmed it was operable first! Paid for my gas, got geared back up, jumped in the saddle and turned on the power. Motion by my left foot caught my eye. I looked down to see gasoline gushing out of my motorcycle. I was a little stunned. In some sort of state of shock. With my wits mostly going off in various directions I turned off the power and wheeled the bike out of the way. Had a closer look, removed a piece of ‘protective’ bodywork and saw the damage. The exterior portion of my fuel injector had been sheared off! I’ll not repeat what I was thinking of BMW while staring at this obviously horribly exposed piece of critical equipment! How could this happen?! 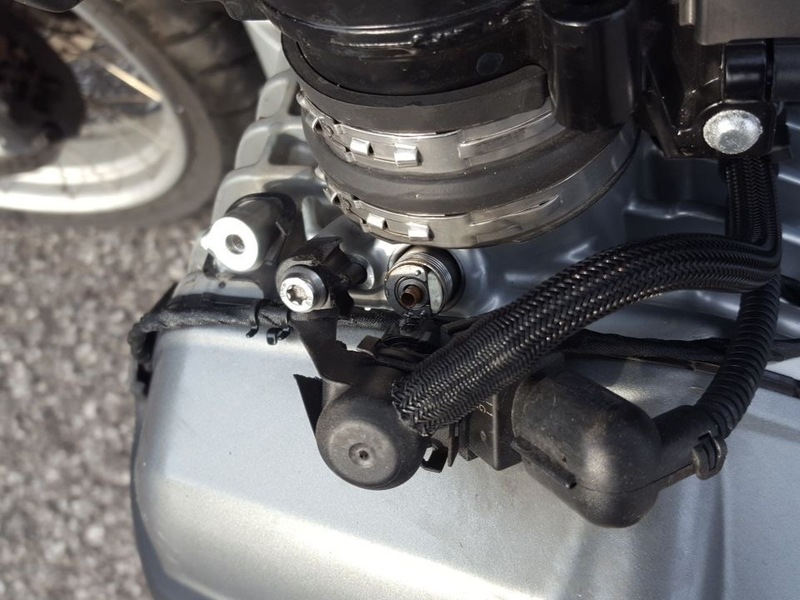 As it turned out, when the bike tipped over, it was positioned so that the cylinder head fell just beside the pump’s concrete island, which allowed the lip of the concrete island to impact the fuel injector assembly, which is protected only by a heavy plastic cover. Not much protection when the weight of the bike is laying on it. Had the bike been an inch or so closer or farther from the pump, I’d have escaped with just the scratched plastics. I was 250kms from home. I called CAA at 6:16PM. They were busy so it was a bit of a wait before someone could take my call. After initially logging the call they had to transfer me to the “Ontario East” region (my “home” region being something else) so I was on hold again. Finally by 7:27PM a truck was on its way to pick me up! Just kidding. That’s just what the text message from CAA said. At around 7:53PM the dispatcher called to see if the truck had arrived. No. Ok, so they’ll try calling the driver and get back to me. Text message with an ETA update. 8:34PM - Dispatch calls to see if the truck has arrived. Nien. The driver is not answering his phone. (But seriously, just call another bloody truck!) But dispatch insists on trying once more. It’s getting dark and starting to rain. The gas station owners have closed up shop and headed home. 45 minutes goes by with not a word from dispatch. So I call CAA again. On hold again. Transferred to East again. On hold again. Finally speaking to another dispatcher and they too try calling the original driver but aren’t having any luck. CALL ANOTHER TRUCK! 9:38PM - Finally dispatch sends out a new driver with a 40 minute ETA. But Lady Luck was smiling upon me that day! The new driver is there in about 20 minutes. And this kid was great. He got me squared away real quick. We stopped at that Tim’s I was going to stop at 3+ hours ago for some coffee, and had a nice chat with some random moto guy whose daughter actually works at the dealership where I bought my R1200GS, and the dealership CAA was going to haul it to. An hour later we dropped the bike off at dealership. The driver was kind enough to drop me off at my hotel. I suspect the dispatcher told him to go the extra mile on this call. Still, kudos to that young lad from Leduc towing, and a pox on CAA and the guy from Garage Lamarche who was supposed to pick me up. Whose shop was, by the by, 1 minute down the road from the gas station where I was stuck! So, first call at 6:19PM. 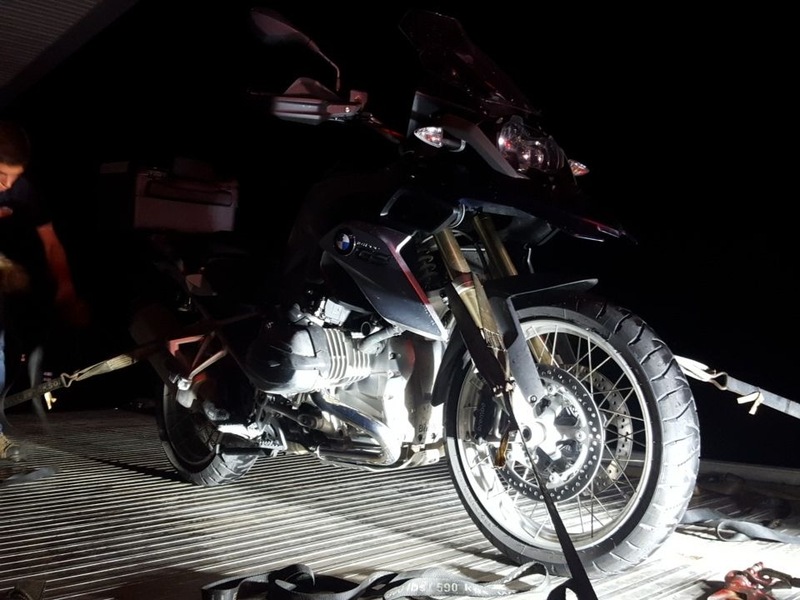 Dropped the bike off at around Midnight. Around 6 hours to move a motorcycle 83kms. CAA dispatch should not have waited anywhere near so long before sending another driver. And I shouldn’t have waited so long to start telling them to send another driver. Call BMW Roadside Assistance … maybe their response would have been better. So the next day (Monday, July 17th), I was at the dealership well before opening. Once the shop opened I got my bike logged in and was immediately told it would be a day or two before it even gets looked at it. I was a little dismayed. I asked the guy at the desk if someone could at just take a quick look. Which he did. Which wasn’t very helpful. Their BMW mechanic could have taken a 30 second glance and told me what he thought. For the record, if you’re a Harley-Davidson owner and you break down while traveling the nearest H-D dealership will put your bike at the front of the line for assessment and, if possible, repair. I really truly completely love my GS, but BMW could learn something here. So I caught a cab to the train station and booked a lift home. While waiting I called BMW to ask if they offered anything like priority service for travelers. Nien. That’s up to each dealership. I called the dealership to ask the same. I was assured the bike would be looked at and I’d have an estimate before the end of day but it was definitely not going to be fixed that day. I never did get that call. I did get a call this morning (Tuesday) with an estimate. The estimate was less than I feared, but some of the parts would need to be ordered in from Germany, with a delivery time of 7 - 10 days. I forgot to ask if those were weekdays or business days. Also, I am supposed to be leaving on a trip to Maine, USA, in ten days. Oh dear… I called back. One of the service people offered to try getting the parts from BMW in the US, but it didn’t sound promising. Again, promised a call before the end of the day, but no such call was to be had.